Fall color forecast for the weekend. For many of us, October is one of our favorite months. The heat of summer is gone and the chill of winter is still a few weeks away. As the days grow shorter and the nights grow colder, one of the most beautiful times of the year comes into focus. Most trees have a uniformly green look during the summer, but in the fall their true colors come into view just ahead of the long gray winter. 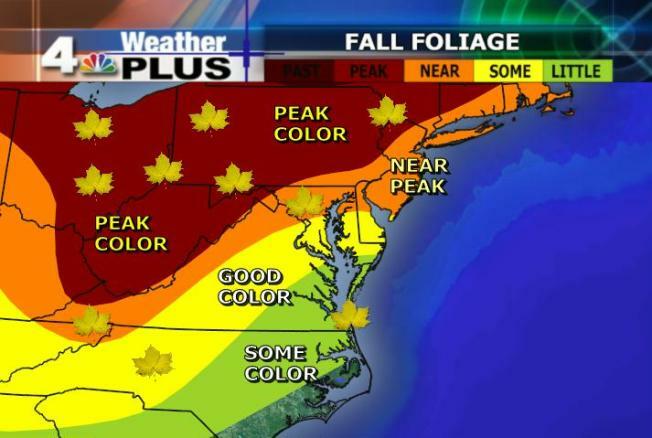 We are now nearing the peak of the fall color in the Mid-Atlantic. Good color is now moving into the D.C. metro area, near peak color is as close as Skyline Drive and the full spectrum of fall is on display in western Maryland and southern Pennsylvania. The spendor of fall does not last long. Most leaves drop off within a week or so of changing from green to yellow or red, so time is of the essence. The two things which can shorten the fall color are a hard freeze and a strong wind. Most of the mountains have already had a freeze, and the first half of this weekend looks quite breezy, so it will be important to get out and enjoy the beauty while it lasts. The weekend forecast call for rain and wind on Saturday, but mild sunshine on Sunday. Spend Saturday coming up with a plan on where to go and spend Sunday outside in the fresh air. Some of the best places to go, which are close to the D.C. area, are Skyline Drive, the Shenandoah National Park, Deep Creek Lake, Harpers Ferry and Gettysburg. More cool nights next week will bring the peak color right into downtown D.C. for next weekend.